The Braven 805 wireless Bluetooth speaker is a colorful new addition to the manufacturer’s Design Series. The newcomer made its debut last month during CES in Las Vegas as part of a serious product onslaught by the Utah-based manufacturer. Founded in 2011, Braven became part of the mobile accessories giant Incipio in the summer of 2013. Joining the bigger company has treated Braven quite well. Its product range has expanded to cover everything from ultra-rugged speakers to luxury offerings in a variety of shapes and sizes. At a quick glance, the Braven 805 looks like a close relative to the metal-clad Braven 850. However, thanks to its polycarbonate body, the newcomer is lighter and more affordable. Braven 805 is available in a variety of different colors. They include black, white, dark gray, magenta, yellow, red, orange, green and light blue. The speaker features two high-sensitivity 10W drivers, two passive radiators, dual-band limiters, and built-in microphone and speakerphone. SRS WOW HD bass-enhanced music setting is also on board. Wireless connectivity is handled via Bluetooth v2.1 + EDR and aptX. The speaker’s wireless range is 10m (33ft). A standard 3.5mm audio jack is also available alongside a bundled cable. The speaker can also be paired with a sibling in order to provide much bigger sound with left and right channel stereo. Braven 805 is powered by a 4,400mAh rechargeable battery. The latter can also be user to charge mobile devices via full USB port with 1A of output. Physical measures of the speaker are 241 x 71 x 101.6mm. Its weight tips the scale at 1.27kg. The speaker is easy to connect with a PC or a mobile device. Once you turn it on, it enters pairing mode and shows up in your gadget’s Bluetooth settings. The majority of the speaker’s controls are placed on top. A battery level button sits on the right side; long-pressing it allows you to pair the 805 with another compatible Braven speaker. Braven 805 can accept and end calls when connected to a compatible device. The dedicated button and the microphone pinhole are both located on top of the device. The 4,400mAh battery of the speaker is quoted at offering up to 18 hours of playtime. It takes roughly two hours to top the battery up with the bundled charger. Braven 805 looks great in the flesh. Thanks to the wide variety of available colors, you can make it fit easily on a desk, in a living room, or anywhere else you like. The sound signature is well-balanced and highly enjoyable, especially if you like bass. Distortion is all but completely missing even at high volume. Battery life is impressive, though I couldn’t quite reach the advertised 18 hours of playback. Real-life use of 12+ hours however is easily achievable. The backup battery functionality is also a welcome addition to the feature set. 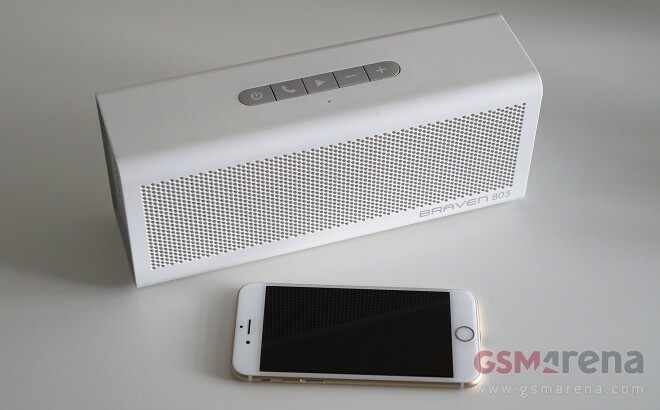 The range of the speaker is fairly limited because of the Bluetooth 2.1 standard. There are competitors with much bigger range for the same price as the Braven 805. At 1.27kg, the speaker is not the most compact premium offering out there. However, to be fair, Braven will gladly sell you a smaller speaker if you want. The startup sound is extremely loud and intrusive. I wish there was a way to turn the thing off or at least tone it down. The Braven 805 is among the most characterful wireless speakers with a sub-$200 price tag. Its good looks, solid build, and well-sorted sound signature make it a great alternative to any of its competitors and a great daily companion. Braven is asking $199.99 for the 805 in the company’s online store and on Amazon. For the time being, the speaker is priced a tad too close to the just as capable, metal-clad Braven 850, which goes for about $210 on Amazon. If you don’t mind the extra weight, I’d recommend that you opt for the more premium offering – Braven surely won’t mind.